Its the beginning of August, which means its time for a new Stamp of the Month! 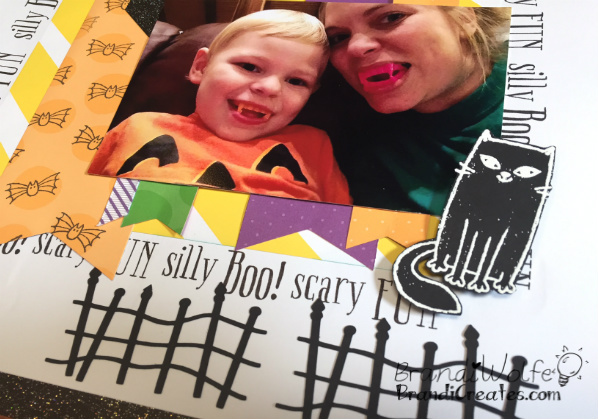 I had so much fun creating with this months stamp, A Purr-fect Halloween. For these two layouts, I used the scraps from our new Adventure Fundamentals layouts that I will be revealing soon, and used White Daisy Cardstock as my base pages, matted to Black Glitter paper. The words on the stamp set were Purr-fect (see what I did there? lol) for these Halloween photos of my boys two years ago (yes, I’m that far behind on scrapping, but who isn’t?) Silly, Fun, Boo, and Scary summed it up! Get this D-size Stamp of the Month set for just $5 with a minimum qualifying PURCHASE! Stamp images outlined in red coordinate with the Cricut® Art Philosophy collection (Z3171). Previous BRAND NEW ANNUAL INSPIRATIONS IDEA BOOK! Next Basically the Best special yet!